After two years of genteel coaxing of millions of Americans to sign up for health insurance under the Affordable Care Act, the Obama administration has begun to turn up the heat with a sharp increase in tax penalties and other sanctions. While many people found it far less expensive to pay a penalty instead of enrolling in a new government subsidized health care plan, they will be in for a rude awakening if they try that again. In fact, in some ways it will be cheaper to purchase one of the more modest insurance plans than to pay the penalty. For individuals who went without insurance in early 2015 despite being eligible to enroll, the average household penalty in 2016 will be $969 – a 47 percent increase over the average estimated penalty of $661 in 2015, according to a new analysis by the Kaiser Family Foundation. People who are eligible for federal premium subsidies will have to pay an average household penalty of $738 in 2016 if they don’t sign up, while the average household penalty will total $1,450 for uninsured people who are not eligible for any financial assistance. The penalties mandated by the Obamacare legislation were designed to force millions of uninsured Americans to purchase health insurance policies from a variety of choices. The increase in signups is considered a key component in attracting private insurance companies to participate in the program. But the enrollment effort has repeatedly fallen short of government forecasts and expectations; the Department of Health and Human Services currently is projecting an enrollment next year of 10.1 million individuals – just 100,000 or so above this year’s level. Whether the tougher regime of penalties makes any appreciable difference remains to be seen. The so-called “individual mandate” to force uninsured Americans to sign up for coverage is arguably one of the least popular provisions of the controversial law. Today, there are about 10.5 million uninsured Americans eligible for coverage under Obamacare, including about 7 million who could qualify for premium subsidies. They are considered the prime target for the program’s marketing strategy. As the Kaiser Family Foundation study points out, nearly half of them could purchase a “bronze” insurance policy – the most basic of coverage -- for less than the penalty they would owe. A quarter of those enrollees could escape paying any premium at all once their tax subsidy is applied. 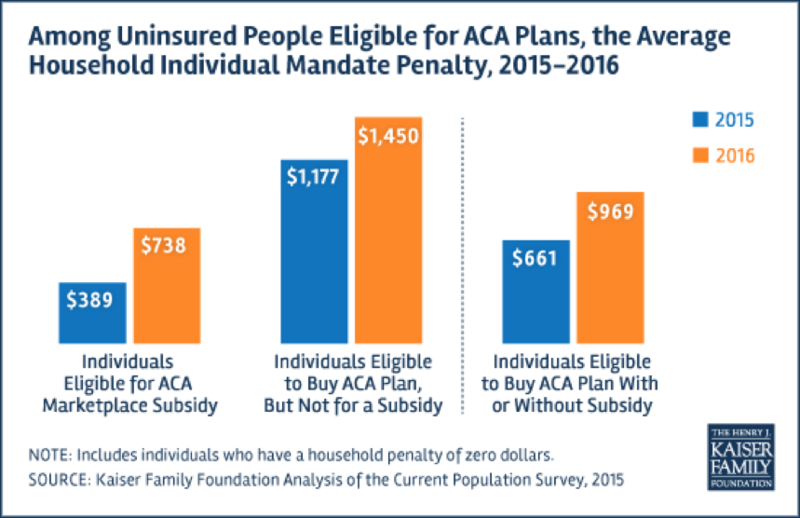 “In other words, 3.5 million subsidy-eligible uninsured people could either get coverage for free or end up paying less by enrolling in marketplace coverage than by remaining uninsured and paying the individual mandate penalty. However, that may be less of an enticement than it seems. Bronze plans come with high deductibles or out of pocket costs and those are going to be much higher in the coming year. Low-income enrollees may be better off financially enrolling in silver plans that have higher premiums but are eligible for cost-sharing subsidies. Open enrollment for the new insurance season began Nov. 1 and will run through the end of January. The administration this week began stepping up its campaign to pressure uninsured Americans to sign up for coverage, signaling that the government will be far less accommodating than it was in the past, according to The New York Times. For example, the administration announced that there would not be another special enrollment period around the April 15 tax filing deadline, as was the case this year. Moreover, Americans who claimed tax subsidies for their policies this year will have to demonstrate on their 2015 tax returns that they meet the income levels to qualify for the subsidies. If they are unable to provide the necessary income documentation, Obamacare beneficiaries could face tax penalties or stiff deductions from their tax returns to recoup the subsidies, according to some experts. There will be new, complicated tax forms to fill out and more questions to answer, which is all music to the ears of the nation’s accountants and tax preparers. For example, officials of H&R Block, one of the nation’s largest tax preparation companies, are gleefully predicting a bonanza of new clients who must file the special tax returns by April 18. “The era of leniency with the Affordable Act is coming to an end,” said Mark Ciaramitaro, H&R Block’s vice president for taxes and health care, according to the Kansas City Star. Ciaramitro said, “We’re not holding anything back” in terms of mounting an aggressive advertising campaign to tap into the Obamacare tax preparation business.